Review While Walter Isaacson’s biography of Steve Jobs was notable for the contribution, by way of hours of interviews, of the man himself, it could hardly be described as revelatory. The darker side of the way Apple was run by Jobs, for example, was glossed over. By contrast, Adam Lashinsky’s Inside Apple aims to get under the skin of the world’s sometime largest company. And it wasn’t just inside the company’s Infinite Loop campus that Apple kept tabs on its employees. Even before the loss of two iPhones in local bars, the company monitored staff when they let their hair down. ‘BJ’s Restaurant and Brewhouse is tucked so close to Apple’s Cupertino campus that insiders jokingly refer to it as IL-7, for “Infinite Loop 7” a building that doesn’t exist. Company lore holds that plainclothes Apple security agents lurk near the bar at BJ’s and that employees have been fired for loose talk there. It doesn’t matter if the yarn is true or apocryphal. The fact that employees repeat it serves the purpose. The message is clear: what goes on at Apple stays at Apple. Those juicy little nuggets are at a premium, however. And while the stories from former employees, recruitment consultants, and partners are fascinating, there just aren’t enough of them. Apple devotees and long time followers of the company will be familiar with some of these recounted tales, such as the fear Apple employees had of being stuck in a lift with Jobs, lest they were asked to justify their position in the company. 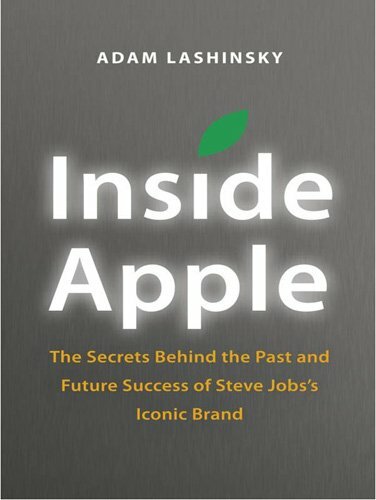 Much of the book is devoted to how Apple was run under Jobs, how it differed from the rest of corporate America and how it might fare now that Jobs is gone – OK in the short-term, not brilliantly after that, according to Lashinsky. If you care that Apple is run with a functional rather than divisional structure, or that Jobs valued engineering and design chops over academic qualifications, you’ll find Inside Apple a fun and informative read. If you don’t, there’s just about enough salacious gossip in the first few chapters to keep you entertained. An entertaining read for Apple fans, but lacking in juicy gossip for everyone else.